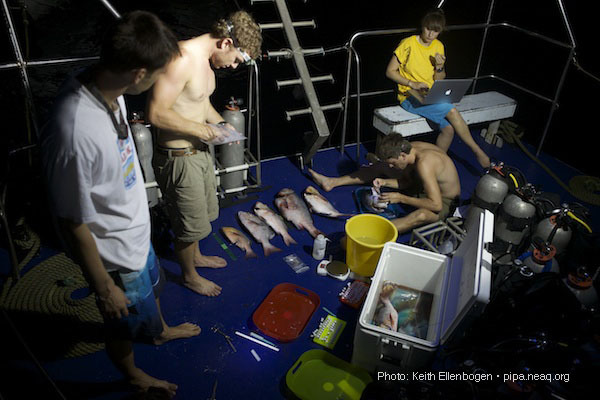 This post is from Kelton McMahon, post-doctoral fellow at WHOI and KAUST after the first day of diving near Kanton Island. The world seems to operate in threes. After three flights, through three different countries, and three days of open ocean transit, we finally arrived in the Phoenix Islands (Kanton Atoll to be exact). With an anticipation-filled three count by our boat captain, "1…2…3! ", we rolled off the sides of the skiff and into the crystal clear waters of the tropical Pacific. As the bubbles cleared, I realized that we were surrounded by more sharks than I’ve likely ever seen in my life … cumulatively! The sheer biomass of top predators, including snapper, grouper, sharks and tuna, was breathtaking. Which begs the question, how can there be so many kings of the jungle so to speak in such a small area? It’s so perplexing in fact, that this paradox of the coral reefs has been a burning question among marine ecologists and conservation biologists for decades. The remote nature of the Phoenix Islands means these fragile ecosystems are some of the more pristine coral reef habitats in the world. 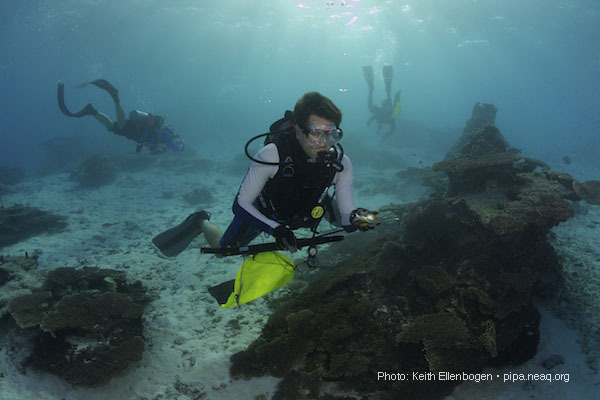 As such, the Phoenix Islands provide a unique and rather remarkable opportunity to see how coral reefs used to function before the over exploitation of most of the top predators on reefs systems worldwide. One of our many goals on this expedition is to collect samples from a variety of coral reef fishes that span a wide range of feeding guilds. In total we will visit five different atolls, and collect ten individuals for each of the seven different species of coral reef fishes: Bicolor chromis (Chromis margaritifer), Golden gregory (Stegastes aureus), Arc-eye hawkfish (Paracirrhites arcatus), Chevroned butterflyfish (Chaetodon trifascialis), Bullethead parrotfish (Chlorurus sordidus), Bluespotted bristletooth (Ctenochaetus marginatus), and Twinspot snapper (Lutjanus bohar). In addition, we will collect four different base of the food web end members (coral, algae, phytoplankton, and detritus). For each of the fish, we will collect a variety of samples, each of which will provide a different puzzle piece for solving the paradox of why coral reefs are so productive in such unproductive waters. 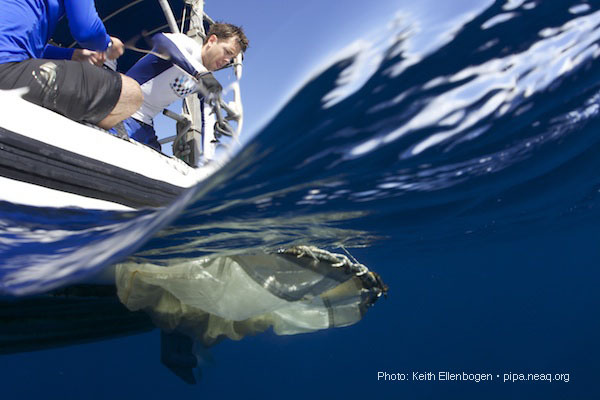 Kelton McMahon, post-doctoral fellow at WHOI and KAUST, collects fish to reconstruct a food web. Perhaps in such a remote place, with no fishing pressure, these fish may grow to be much older than we originally expected. In addition, otoliths act like black box flight recorders on a plane, providing a chronological record of the chemical addresses of all the places that fish has been in the past. This will help us determine which habitats are essential for these fish at different times of their lives. This information is crucial to design conservation policies, including MPAs. Finally, we’ll collect muscle samples for stable isotope analyses. These analyses let us know what the fish has been eating in the past month or two. By comparing the isotope values of the fish to the base of the food web end members, we can reconstruct food webs from primary producers to top predators. This will be particularly interesting, since the Phoenix Islands reefs support so many more apex predators than nearly any other reef system in the world. This window into the world without out human impacts (well, fewer direct impacts anyways) may just unlock some of the mystery surrounding the paradox of the coral reef. After three amazing dives on our first full day at Kanton Atoll, we’ve already collected the 70 individuals that we need for this site. The next few days will be spent helping the other scientists with their tasks, and looking for manta rays to tag … but more on that project later. Read more about sharks and the Phoenix Islands food web in this post by Stuart Sandin from the 2009 PIPA Expedition. That expedition also featured this close encounter between National Geographic photographer Brian Skerry and a gray reef shark.